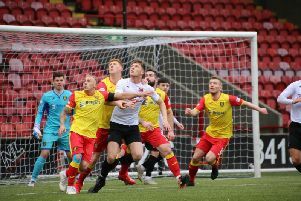 Berwick Rangers last night launched an online campaign to help striker Ousman See as he recovers from a serious double leg injury during the weekend game at Montrose. A tiler by trade, the part-time player’s ability to earn from his normal job is affected and the club is looking to help support him financially over the period of his injury. The Shielfield side are hoping the football community, supporters and the public will come together in support of his situation. See was left lying in agony for more than an hour after suffering a sickening leg break against Montrose at the weekend. The match didn’t end until close to 6pm as play was halted for an hour and 12 minutes. See didn’t get up after being robbed of the ball inside the home half in the 26th minute. Play continued for a few more seconds until referee Willie Conquer blew for a foul by Gary Phillips and, with other Rangers men pointing to their injured colleague, the action was halted completely. Though first aiders were quickly on to the pitch, the leg injury was such that an ambulance was called. A long wait ended with the ambulance crew taking the field at 4.15pm and when See was eventually stretchered off, it was to sporting applause from the 805 spectators, many in the Main Stand on their feet. It has now been confirmed that he has a broken leg and a dislocated ankle and is facing a long time out.